Muhammad Shalihin Bin Majid is from cohort 6 of the TNTA programme and is currently sailing with Neptune Ship Management Services Pte Ltd.
Shalihin got to know more about the TNTA programme through a career fair. He was attracted by the wide range of career opportunities available for him on international shipping vessels and working on a sea-going vessel appeals most to him. The TNTA programme has shown him boundless opportunities abroad and this has challenged him to look beyond his horizons. Through his seafaring journey, Shalihin hopes that the voyages will allow him to explore new grounds, gain global insights and enable him to be financially stable. One of the most memorable experiences Shalihin had was to witness wild dolphin’s race alongside the vessel in front of the ship bow. He was amazed that the wild dolphins are much larger and different unlike those at the Singapore’s Underwater World. He also enjoys participating in the Man-Over-Board (MOB) drills. 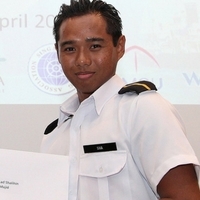 Initially, Shalihin faced communication barriers with his shipmates of different nationalities. However, he was able to overcome it with a positive mindset. Spending almost 3 years of sea services has challenged his character and attitude to develop better interpersonal skills. Shalihin said that the food onboard is great unlike people’s misconception. The company also covers lodging and medical benefits and he feels well taken care of as a seafarer. Shalihin strives to become a responsible Captain one day as the TNTA programme has taught him to persevere in this course. Through his seafaring journey, he has learnt that safety among his crew is of utmost priority and everyone is responsible for his own well-being.